One thing really struck me: at both events, energy conservation emerged as a big theme, in a way that is relatively new in these circles. Just a few years ago, it would have had barely a mention. Certainly I don’t remember the issue coming up at industry-led renewable energy conferences where it was more likely to be seen as a potential obstacle because it would reduce demand growth and therefore business opportunities. Fast forward a few years, and add a financial crisis to the mix, and the renewable energy industry now recognises it has a strong interest in demonstrating that green policies are affordable, to avoid backlash from politicians and the media. And that’s where energy efficiency has to come into the equation. Not that the media really gets it yet, particularly in the UK. At the ODI event, a DECC spokesperson presented some figures on the average cost savings on UK energy bills from energy efficiency. Seeing that product policy is by far the biggest money saver, I felt very proud. I have been among those pushing for strong minimum energy efficiency standards for products sold in the EU (a market of more than 500 million consumers). I helped the WWF European Policy Office to launch its work on this issue from 2001-2, and later set up with other NGOs the Coolproducts for a Cool Planet campaign, which continues to keep pressure up to this day. 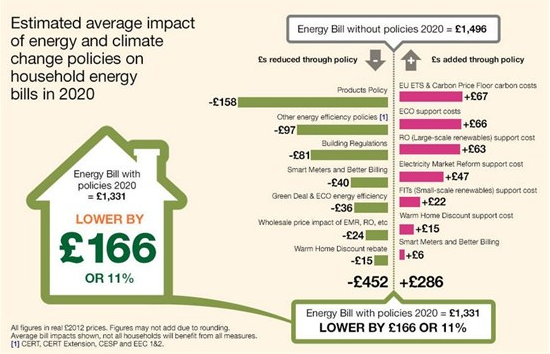 Of course, much more could be saved with more effective policies to insulate the UK’s draughty homes. Inexplicably, this policy now appears be under attack, as politicians run after cheap point-scoring with irresponsible media outlets that are unable or unwilling to understand how important and cost effective this is. But UK press coverage of the great things that have been happening on energy conservation has for a long time been extremely misleading and unhelpful. I remember having to deal with the absurd and unsubstantiated claims made by the UK media at the time of the the EU phase out of inefficient old lightbulbs, or later on boosting the efficiency of vacuum cleaners. Both policies have in fact now happened, and guess what, the world has not caved in, there are no people being left in the dark, or mysterious illnesses appearing, or allergies increasing (all these were real claims made in the UK media)… But you would not expect the Daily Mail or Sunday Telegraph – among others – to issue an apology for that (or even the Guardian Comment is Free, which inexplicably also joined in that specific EU-bashing exercise at the time).